According to the mythology of the Gikuyu, the first parents Gikuyu and Mumbi after arriving at Mukurwe wa Nyagathanga begat “nine” daughters who were the subsequently the mothers of the “nine” Kikuyu clans that bear their name. This is what Father Cagnolo writing in his book “The Akikuyu” published in 1933 wrote. Professor Wangari Maathai in her very well written autobiography “Unbowed” recaptures the true tradition of Gikuyu storytelling by giving a colourful snapshot of the Gikuyu cultural traditions she grew up in. She enumerates ten clans saying she herself was from the Anjiru clan like this blogger. It is in his later and more influential “Facing Mount Kenya” that he conceded that there were nine major clans, suggesting erroneously that there were major and minor clans. I find his thesis unacceptable because it flies in the face of the more powerful facts regarding enumeration and furthermore, the order of the names changes all the time according to who is enumerating though it is normal to end with Warigia. The name, Warigia means ‘the last’ and it may very likely be that she was the last born. However the name Warigia also meaning ‘left behind’ suggests she is the one who remained in the original Gikuyu homestead and inherited her father’s property after the rest had left to establish their homes and clans. She may not necessarily have been the last born as the order the girls were born is unknown. Most of the daughters and clans have multiple names and which name is predominantly used depends on geographical location. Generally there are two major variations; theNyeri/Kirinyaga (Northern Gikuyu) versions and the Murang’a/Kia Mbu (Southern Gikuyu) versions. The use of various alternative names was what caused Routledge writing in 1910 to erroneously enumerate 13 clans. Below in bullets, are the names of the daughters and their corresponding derivative clan names. The name starting with the prefix Wa is certainly the main name. Each may have more variants depending on location but the main names prefixed WA are conclusive. The Nine Full Beauties as photographed by Father Philip Perlo of the Consolata Mission Nyeri between 1902 and 1930. Exact date of photo not given. When the girls became of age and began to have yearnings for their own husbands, they went to their mother and asked her where she got her’s. She took the problem to her husband Gikuyu. Gikuyu consulted Ngai, God and Ngai asked him to make a sacrifice of a spotless ram under the fig tree “Mugumo”. He called his daughters and asked them to go to the Mukuyu and for them to cut for each a straight rod of her own height. Nine of the girls brought the rods and their father placed them on top of the fire as ndara and then placed the sacrifice on them. In the morning NINE young men appeared and each of the daughters took a mate her own height. Apparently, there is confusion in the myths as to whether nine, relating to the young men means nine in the real sense or it meant “nine full”. What seems to emerge from the various stories is that one of the daughters, Wamuyu was too young to take part in the rods’ business and their heating (ahem! Let me swallow that one) but nevertheless later had children and descendants. The interesting story of this daughter, Wamuyu, who remained unmarried but nevertheless as a single mother became the mother of the Aicakamuyu clan deserves to be dealt with separately in another post here. To listen to the explanation of clans in Kikuyu by Joseph Kamaru go to the link below. Start with the question by Nduru. Previous Post The story of a man and his wife. Mukuyu, congratulations on another great site on the house of Mumbi. Thanks for the props, I’m the one who did the nyeri-kiambu, blog. I’ve posted the same contents under wordpress. I prefer the wordpress one and it has more info than the blogspot one. I’ve left 2 replies on your comments on my blog and I hope I will continue hearing from you. Speaking of which as far as info on Gikuyu architecture is concerned, the university of Nairobi has a couple of books but you have to be a student ther to access them. What titles are at the UON? can anyone explain how kikuyu people name their children? my dilemma is whether they are named immediately after they are born? i would like anyone with an answer to help me or give me a webpage that i can check out. The Kikuyu name their children according to a lineage system that honours both the patrimonial and the matriarchal lines. When a couple get their first kid, it is named after the mother or father of the man. The second girl is named after her matrimonial grandmother, the third after the patrimonial first aunt, the forth after the matrimonial first aunt and so forth. They keep interchanging. Twins are named from one side either matriarchial or patriachial and not divided. The second daughter is always called Muthoni beside her real name because she is named after the man’s mother in law and he cannot call her by her real name so he uses Muthoni, from the name uthoni meaning “respectful” and derived from the word shame, “thoni”. Everybody else carry second names based on characteristics observed after one is older. Thus you will be called Wangari (From the original Ten names) after your Aunt but also Nyakiyo the “hard worker”. The first is the “Born Name”, the second is the “Given Name” “Ritwa ria Mbukio”. The best way to represent all this is in a diagramatic tree. I will get to it. Thanks for the querry and I hope the answer was helpful. Mundu uguitwo Mukuyu, i viewed your little slide show and was quite impressed. Sorry for the delay in getting back yto you on your question. The catalogue of the uni of Nairobi can be accessed through google by searching these words: Catalogue of the university of nairobi. The search function is excellent and the books in their possession re excellent, especially for some of us who were never taught the ways of our ancestors by neither our grandparents, our paros or the Kenyan state. & Response of Kikuyu pre-colonial architecture to the enviroment by J.G. Wachira. Some of these might just be papers written by students and most seem to be published by the uni of Nairobi. I can’t vouch for any as I haven’t got the access to any. As far as Uni of Nai goes, you can look but you can’t touch. Two things: First, The Agikuyu babies are named as soon as they are born. Then a messager is sent to announce to the relatives, especially the one the child is named after that he or she has arrived. Secondly, has anyone done a research to rrace their clan homestead. I have. It is exciting to get all the details. I had to squeeze information out of my Mom (age 87) and her brothers. See if you can get your oldest relative still living to do that for you. I found out some of my “friends” are actually real blood related cousings. Have fun!! nyerikiambu thanks for the book titles. I am told that Leaky’s book “A History of the Southern Kikuyu before 1900” at the University of Nairobi main library was stolen. How about that!!! Ndirenda gwitikania nawe handu-ini ha muicakamuyu, I think it refers to the daughter who never got married. As such, kids morn out of wedlock are “Aicakamuyu” coz you take your father’s muhiriga and in this case you got no father….. I remember discussing this with my grandpa and he told me this, he may not be an authority but thats what I have believed all these years. Every Mugikuyu has ancestry or lineage to the nine(ten) daughters. That you have no father (??) does not consign you to a clan (Aicakamuyu) – irrespective of who sired you. Such children are adopted by the mother’s family and clans. This is a moot point. Originally in the era of matriarchy when children belonged to the woman, everyone was born into his/her mother’s clan. Aicakamuyu then carried “original sin” so to say, of the famous unmarried Warigia forever. When the new order of patriarchy came about it meant that the “Original sin” of the Aicakamuyu was wiped out every time a Muicakamuyu married and adopted her husband’s clan name. A woman marrying into the Aicakamuyu joined that clan. Children of the latter era including today born out of wedlock belong to the clan of their sinful mother’s father. They are not necessarily Aicakamuyu although some adopt that clan as a way of asserting their identity. Others become so when they are disowned by the sinful girl’s father. Warigi’as decendants were both men and women and in all possibilty all got married(maybe some didn’t) and continued the downline upto today.A stigma if any is only with with the matriach Warigia but not necesaarily with the decendant. Am of the view that it’s just a statement that Warigia never got married but not necessariry a sin. Once again I assert that being born out of wedrock doesn’t make you of ‘muichakamuyu’ clan and it never did. Will you read with some care Mr Muriithi and listen carefully. You belong to your father’s clan in today’s system. If your mother is a single mom then you belong to your grandfather’s clan but sometimes you are disowned and become a Muicakamuyu. There used to be a time when you partook of your mother’s clan name. Is that clear enough? The use of “original sin” in quotes means it is used as a figure of speech and does not imply that Wamuyu sinned. The case of Wamuyu does show that single motherhood was an accepted reality in traditional culture though it later came to be looked at as a grave sin by Gikuyu Christians. Mukuyu, I think your work is excellent! You have taken time and care to educate us and I really appreciate that. I have been trying to find out more about my roots especially since the recent national events. I came to find out that ‘Irungu’ was an ageset/group that is considered to have failed in it’s mandate after it took over from ‘Mwangi’. This has led to a dysfunctioning in the handing over to the next age ‘Maina Kanyi?’ I found all this very interesting but very complex. Do you have any works on this or do you have any references? Once more I am very grateful for your work. By the way, I’ve heard of stereotypes about General characters and personalities expected of people from the various clans eg, women from this clan behave like this, men from that clan are like this. Were such stereotypes held in strong reagrd in the past? Thank you Mr Irungu for your comments. On the matter of clan stereotypes Gakaara Wanjau’s excellent book, Mihiriga ya Agikuyu is probably your best bet. It is superb. I have always wondered. Did the Kikuyu travel from Eastern Congo as a fully fledged tribe with their culture as farmers already established or did it all come together after Gikuyu and Mumbi’s ancestors had already settled around Mt Kenya? And around what years are we talking about here? According to Muriuki, the Eastern Bantu who are the cluster of tribes from which the Kikuyu emerged from around 700 years ago were one tribe. This tribe – lets call it the Thagicu, may have been the one whose migratory patterns can be traced up to the Nyambene highlands where differentiation began to the various communities existing today. The kikuyu as a tribe emerged from a split between the larger kamba family and took place at the Ithanga Hill in present Muranga. Gikuyu and Mumbi may have been a family that walked away from the Hill and went on to the present Mukure wa Nyagathanga. I have the means to expound on this explanation. Wow, was surfing arrounf trying to sniff out answers. I have an Ethipian friend of mine who authoritatively informs me that Mumbi’s origin was Ethiopia and that she was the daughter of a powerful King who cherished her dearly, however, she concieved out of wedlock and her mother noticed very early that her daughter was pregnant. Unfortunately, this would have placed the King in a cath 22 situation as pregnancy out of wedlock meant death, the mother (Queen)then packed food and drink on animals, got trusted guards and early in the morning bade her daughter farewell, directing them to head in the direction of the snow-peaked mountain to the south. It is at Mukurwe wa Gathanga that the guards and animals succumed to hunger and died leaving Mumbi to give birth there. He has promised to get me a text from Ethiopia to this effect. Second- i met a 71 year old lady from Karatina yesterday and as she told me about her family, she mentioned her brother who has been mistaken many a time for being a somali. Having a few of my cousins with ‘somali’ hair this somehow just clicked, the Ethiopian story of our origin. As i mentioned that, she became teary eyed, and said that her great grandfather was an ‘avaci’ , they settled arround this area and intermarried with the folk arround here. Can anyone shed more light on this? Are the avaci really from Ethipiopia? Are the Kikuy genetically homogenous? As i study them, i note interesting physiological differences, is it possible that we are a collection of several groups who were swallowed up by a stronger agikuyu group? Or were the nine muiru sons that wed the nine muiru daughters from different ethinicities? Wa Ithekahuno, the story of nine* clans is present in some of the Omotic peoples of the southern Ethiopian Highlands. Notably the Konso people have nine clans. The number nine seems special to them, as I have heard they mummify their kings and keep them for 9 years, 9 months, 9 days, 9 hours after death before they are buried. When I heard of this sacredness of the number 9 amongst these southern Ethiopians I immediately thought of the Kikuyu. And when you see the Konso and other highland people from the Omo region of Ethiopia, you immediately notice how they bear a strong physical resemblance to many Kenyan peoples, rather than northern Ethiopians. Are the Kikuyu genetically homogenous? I don’t think so. I think there is a connection with southern Ethiopian tribes, but also our language is so similar with not only the other Gema peoples of Mt Kenya, but also the Kisii and Maragoli around Nyanza (whose oral histories say they were once one with the Kikuyu and that all came from Misri/Egypt), and with the Kuria in northern Tanzania. Also there is a tribe in Tanzania called Segeju (from Thagicu?) who speak a language closest to Kikuyu than any other. Added to that, the Kikuyu oral history says that the Gumba pygmies were the original inhabitants of Kikuyuland, and that as the tribe expanded southwards into Kabete they absorbed the Athi hunters who lived there. So I think the Kikuyu ‘nation’ has many origins, and has absorbed many different peoples under one language and identity. Could someone let me know the different attributes of the 9+1 kikuyu clans. Wangari Maathai writes that her clan Anjiru was attributed to have leadership qualities. Does anyone know what the clan Aithirandu was attributed to have as a quality? Thanks. The best source for this is Gakaara Wanjau’s Mihiriga ya Agikuyu. He gives the attributes of each of the clans. Some interesting attributes of the Aithirandu he gives are that they were warlike, and they picked fights easily though their warriors were much valued. They were also famous for wooing women and great in the leading of song and dance. Does anyone know what particular trade/trait was attributed to the different clans represented in terms of either craftsmanship, leadership etc? – I am particularly interested in the “Aithirandu”/”Angeci” clan (derived from the names Waithira or Wangeci). Wangari Maathai speaks of her clan the “Anjiru” as the clan known for leadership! If anyone has information regarding this, or an idea of where I could access this information – books, essays etc. please let me know. Hi I am also curious about Kenkyuk’s query above about how particular craftsmanship was attributed to a particular clan. Wa ithekahuno, nindakena kuona ati turi a muhiriga umwe. Uhoro ucio waaritie hau iguru na uria utaariirio muhuro waguo niwama. It is believed that the Proto Kikuyu are originally from Ethiopia, had links with the Jews. did you know that the Agikuyu, The Ayahudi and the Ibo of Nigeria have similar cultures and traditions? consider the Book of Esther 8:9, it suggests that ethiopia was once under the king of israel in the 27 known provinces. when the Seers guarding the ‘Managi’-Ark of the Covenant (which had been brought to Ethiopia by the son born of King solomon and the Ethiopian Queen during his coronation), the seers realized that it was threatened by the ‘Tunyaga’ or “Nguo Ndune’, they decided to protect it and headed for the white peaks south of Punt – Ethiopia (also believed to be the source of the nile via a meditteranean channel) So Seers headed for the White peaks of Mt. Kenya, through the Coastal regions where the fight for the managi intensified. the Seers broke a makeshift managi to try and trick their persuers but the fight only intensified. they made their way to Mt. Kenya region where the managi and other sacred Scrolls were hidden in a secret location facing the ‘Kigoongona kia Maai’ -Water Tarbenacle. The Abaci (whom you refer to as Avaci) are originally from Ethiopia, They form Part of the Lineage of the Agikuyu. These people settled near and around the Mt. Kenya to guard the Sacred Locations of the Managi. The seers continued with the worship in the vicinity of the Kigoongona kia Maai. It should be Noted that only the Chief Seer was and is Around in the Water Tarbenacle. If anyone is interested i can narrate how the worship of the Agikuyu here was related to the Heliopolitan Worship of the Egyptians, how the Geometry of the Great Pyramids are relative to the Peaks of Mt. Kenya and the Legends of Njathi and Kiahu…. The stars.. and so on. Anyway, these people are the Proto Agikuyu. They later dispersed and clustered themselves in groups, influenced and got influeced by other natives of the land hence the different but interelated tongues. Waithekahuno, i hope this answers some of your questions, i don’t have all the answers i even doubt whether everything i say is true. I did my final Theology research paper on our roots, it’s so facsinating. Am so happy that people are interested in our roots. Concerning the Muicakamuyu, it is believed that this was a clan of the unmarried daughter the Tenth though not counted since Agikuyu don’t count their people or even ‘Mahiu’ to the last one. Kenda muiyuru ni kuuga ni hari wa-ikumi. Hey Anne,I think craftsmanship was attributed to particular clans because of specialization. If particular families were good at a specific craft, and that’s what they had to do for a living, then it was likely that their children, grandchildren and so on and so forth would hone their skills. In time, they would become experts at one (or more things), and less skilled at others. Especially if they lived in societies that were striated by class (like most ancient African kingdoms were). So some people would be good at metalworking – weapons, tools, ceremonial items..etc, others crop farming, animal husbandry, architecture, painting, midwifery, hunting, warfare, trade etc.. It is a wonderful condensed history of Kenya. I always heard about my people, Maragoli, migrating from Egypt, and I thought that the split from the Gikuyu, Aembu, Meru, Akamba was a myth. I knew that we were sort of related to the Kisii, but this site gave me more insight. Which reminds me of the one time I heard an elderly lady say (in Kikuyu) in a matatu, when I was in high school (I hope I can write it correctly) ‘…Nuwikara haha…’ I thought she was talking to me, but she was talking to another elderly lady, who proceeded to sit down. On another occasion, I was watching Shaka Zulu. And he said to his army ‘…Ikara mbanzi…’ and they sat down. We are more tied than we think. This is quite interesting and am thankful for the selfless work of the blogger. I am a Mùmbùi but thats the only thing I know. How pityful! I am one of the kikuyus in the rift valley, Kitale to be precise. Would you please shed some light on why we are often referred to as the Kikuyu in diaspora. I got interested to discover my origin from the effects of the recent political developments. Does any myth tell us more on who were the immediate children of Mùmbi’s daughters? I think the reason for the presence of Agikuyu in Rift Valley might be either of two things (I’m not sure which is more accurate). The Agikuyu had connections with the Maasai and during times of hardship such as war, Agikuyu women and children would be taken to the Maasai for safekeeping and vice-versa.Some of these women intermarried with the Maasai (and Is uppose vice-versa. The other reason I might propose is that when the ‘White HIghlands’ were being carved up the Kikuyu who were displaced were forced to resettle in the areas of the Rift Valley? # Wangui Wa Kamonji,to answer your question,the reason why there are kikuyu’s in rift valley was as a result of kikuyu’s migrating in search of more land to till and rear their livestock.My great grandfather Mutumbu( Kamau) wa Wangunyu,went to the rift valley to buy land in Nakuru,(Subukia) This happened in the early 1920’s.I understand he bought a lot of land through cows and goats.He later died of malaria & we never got to know exactly where the land was.had he lived a little bit longer,am sure we would have migrated to subukia.He was not the only who did that.i understand a lot of people during his time did exactly that.so to answer your question,it is the quest to find more land that there are so many kikuyu’s in the rift valley. Your post here is just but good work on the history of Kikuyu people. I should be very interested in your post on Warigia (Wamuyu/Wanjugu), who is the girl that remained unmarried. Its wonderful what u are doing, I have a question….we recently discovered that we come from the clan of the Ethaga, can someone please tell me who they really were and what distinguished them so…. This question has been coming up so often that we will have to do a major write-up of all the clans and their characteristics. FIRST MOTHER: Wambura aka Wakiuru. NAME: They were called Ethaga or Akiuru or Ambura. (Singular is Mwithaga.) The last name because of their major task in the tribe as rainmakers (kuria mbura) or unmakers, (kuhuha mbura). the latter being necessary when there were major functions like circumcision or songs, ruimbo, organised. WAR AND PEACE: Ethaga are peaceful people and never quarral anybody as nobody would dare cross a Mwithaga. They never retreat when the cause for war is set and they (the clan) go forward all together as a body. THEIR LEADERSHIP IN THE TRIBE – UTHAMAKI WAO: Ethaga were very just people and we could liken them to the Chief Justices of the tribe since they never misused their power of the tongue. When a thief or murderer or other miscreant could not be found, the community went to a renowned Mwithaga as a last resort. He would go round at night uttering in a loud cry his curse and by morning the stolen item would be returned or the murderer given himself up. They were that powerful. PROPERTY: They were rich in herds and owners of large tracts of land. No one would play around with their things including produce in the fields. POWER OF LOVE – UMBANI: They were renowned during the songs, ruimbo and they had a smooth way with women. Their women were never objects of lust as the consequence was well known. When one married a Mwithaga woman one had to keep her nicely and not mistreat her. THEIR WOMEN: A Mwithaga woman is faithful to her husbands people and forgets her own people completely though she pretends that she still loves them in order that they don’t curse her offspring. They are very generous but choosy in their generosity. They never forget a wrong. They are also very hardworking and self-sufficient in their ways. She has no quarrel with anyone but try to take her thing or push your border slightly to her side. You will see. EXCLAMATION – KIUGO GIA KUGUA NAKIO (for women): Oh my rain!, Abo mbura iria itu-i!!! The biggest challenge i have ever faced in understanding the Gikuyu culture is learning about “Mbari cia Gikuyu” (clans). 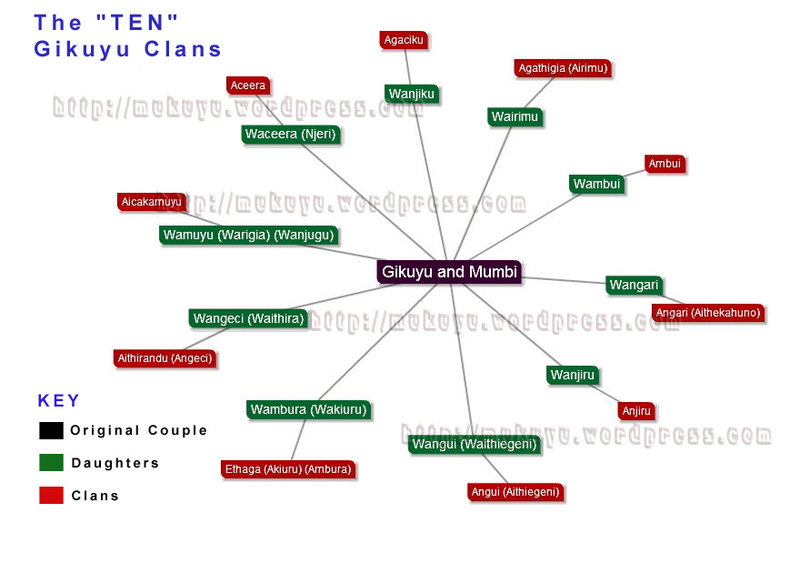 The ten daughters “Kenda muihuru ” had children and these are the clans. Any one with a lead to a book that can give details about these clans? No effects. The children are the same clan as their father. However, if a Kikuyu woman marries into another tribe, say Maasai, the children will be Maasai. i have read the blog with a lot of interest. I am a researcher and have noted alot of assumptions in both the blogger and other contributor’s views. first, the Gikiyu/Mumbi story is a 100 year old myth. it was created after kikuyus had made initial contact with missionaries, and knowledge of genesis helped in coming up with the myth that became the cornerstone of the freedom struggle. the kikuyu were fighting for land given to them by the god Ngai. origins from egypt – leave that to the nilotes. the kipsigis and maasai have better case for that claim. PLEASE READ MURIUKI’S HISTORY OF THE KIKUYU. the correct name of God is Mulungu, a name still held related Ameru and Akamba. Ngai is a pagan Maasai god and is not a creator who gives life. however this name has stuck to the extend that it is taken to be true. prof john mbiti author of the landmark book African traditions and religions has been on a lifelong campaign to have people revert to the traditonal name and have ngai expunged from religious books (local languages) where it was erroneously fixed by colonial european translators. the orgin of the kikuyu is a family that broke from the thagicu, maybe 600 year ago. the thagicu comprised the present akamba, ameru, akikuyu, ambere, chuka and atharaka. (central bantu). there is archeological and oral evidence to support this. infact, it is easier to say that the kikuyu came from the akamba. according to ndeti k. author of elements of akamba life, the kamba and kikuyu share 67% of language and culture. of the 9/10 clans of the kikuyu, at least 4 are shared with the akamba! these are agaciku, amburi, ethanga, and anjiru. the akamba contributed their genes to other communities both in kenya and tanzania. the maasai culture allowed for mingling with other communities, not just the kikuyu. they have contributed alot to taveta, chagga, kalenjin and even meru (eg ntimama). one of the contributors mentioned cushitic features among some kikiyu. lets say you came to central kenya about 5000 years ago, who would you find? kikuyu? wrong, you would come across cushitic communities living in what is now nyeri, kiambu, muranga and other places! however traces of these early settlers were erased through assimilation by the advancing bantu, a process that took place over the last 1000 – 500 years. PLEASE READ MURIUKI’S BOOK. Thank you for your comments. Unlike scholarly works by “researchers”, this is a humble blog that does not claim to have one point of view. The view of the blogger is wide open to discussion in the forum. Multiple opinions are accomodated. “the Gikiyu/Mumbi story is a 100 year old myth. it was created after kikuyus had made initial contact with missionaries, and knowledge of genesis helped in coming up with the myth that became the cornerstone of the freedom struggle”. Such a powerful statement needs all the evidence we can get knowing that the Bible genesis story is not an original story but one borrowed from more ancient cultures from which the Gikuyu and many other cultures retain a memory. This is so fascinating. I’m not even Kikuyu. Our history is so intertwined. I’m Karanga/Shona – Zimbabwe. Just wanted to say Bible and African history are totally intertwined. You should check out the Just Genesis blog by Alice Linseley. She’s spent over 30 years studying Genesis and it led her straight to Kush, to Africa. Her research focuses on cultural anthroplogy, looking at the genealogy patterns and naming and inheritance that you see in Genesis. She believes noahs ark is on mt. Kenya. That makes the kikuyu story even more intriguing. I discovered her when I was doing research on noahs ark. Hallo. Am glad to have discovered you. Av been interested in the Kikuyu History that was grossly distorted by the colonialists and their cronies. Av been comparing the Kikuyu religion with the Old Testament of the Bible, but could not be proud of who I am till I studied the Holy Qur’aan. I can now authoritatively say Gikuyu was the first man (called Adam by the Arabs and the Jews due to his chocolate color), as also evidenced by scientific research that East Africa is the cradle for man, where Gikuyu was placed and has lived kuuma Demi na Madhaadhi. His wife was Muubi, Hawa according to the Arabs and the Jews, with the names having the same meaning. You may call the nine plus one daughters as clans, but with time and thorough study you may discover they are the world races, the blacks (Wa Jiru) having been the first race on Earth, giving birth to other races as black will give others but none can give black. Thus Wa Jiru was the first “girl”. In the Holy Qur’aan we read that after human races were destroyed by rain at the time of Nuh (peace be upon him) there followed a human race that was like no other, the “Aad Iraam. The Kikuyu call them Adu Irimu (Marimu) and discribe them in the same way. Wa Irimu, a girl named after these people, is placed as the sixth daughter by some, most probably the 6th race to come up on earth from the first that was black. Am irritated when I hear people placing the Jews where they don’t belong due to propaganda campaign in the Name of God. We must retrace and reclaim our position as there is no one like us, nor a land like ours. Ask those who have traveled on earth. @Anne. You say the Managi is here in Kenya? Can this place be traced? Do you understand the power of this this thing and what having such power could mean to Kenya as a nation? Also where is this Water Tabernacle? To the author of this blog and the various contributors,am impressed by the information put here. Doesn’t this information make you proud to be a Gikuyu? I was once told by an Old Man that the Gikuyu are the Israeli of Africa. Is this true? Thanks everyone. This does make you think. Doesn’t it? Hallo my fellow Gikuyu brethren. After reading the whole of this page there is this feeling of camaraderie that has come over me,the knowledge that am not the only one seeking to know. @Kirienye Mungari Wa Mbari Ya lkinu,you talk about the Ark and The Water Tabernacle;this is important information. Would you know the present location of this place of prayer and by extension where the Ark could have been hidden? I trust that you have resources from which this information can be obtained as you seem knowledgeable in this matter. Kindly share with us. Maybe we can even organise an expedition. Thank you. I need to know about the main highlights of the clan -Aithirandu.i.e.what the clan is well known for. more so that its composed of the most mean people. I know am a mugaciku wa mbari ya muturi..from my grandma, I learnt that our attributes are, very hard working, jealous, women fight for their men even physically if need be, hate gossip, bribes but cannot be bribed, if they hate you nothing can make them love you again, their no is no and yes is yes..I don’t know how true this is, anyone who has details? So since My Mum is single and she is Wanjiku, but my Grandfather’s clan is Ambui, NOW WHERE AM I? What a complicated history. It’s not as difficult as you think. Your mother’s name has nothing to do do with her clan. She is a Mumbui. You should become a proper Mumbui because right now you are what is called mwana wa ngoriai, born of a father, yes but without him taking you in to his clan. If your mother has brothers, approach one and offer him a goat (a live one). He will then guide you in the process of being born into the Ambui clan. Your mother should be left out of this and the goat must come from your own sweat not hers. Thank you Mukuyu for all the knowldege you are passing to others.To read this is very interesting.It’s good to see people from our great tribe are very knowledgeable and interested in our culture,history and customs.what has been said above,most of it is true to me.my paternal grandmother(Cucu, nyina wa baba) has narrated the kikuyu nine clans( kenda muiyuru) to me.it is believed to count the number ten in kikuyu, is a taboo( mugiro).The aica kamuyu descended from wamuyu who never got married.so today if one’s mother does not get married but has children,then she belongs to the aicakamuyu clan.Many people mistake by saying that the children of the lady who is not married, belongs to her fathers clan.here i beg to differ,she belongs to the aicakamuyu clan. I also beg to differ with the notion that Gikuyu and Mumbi is a 100 year myth AND this is why: My family,mbari ya kihara,of Anjiru clan, descended from Kihara Gathithiri our ancestor.Kihara arrived in Kiambu in 1780 from present day Murang’a and bought land from the ndorobo’s. ( or aathi as they called them)The land which he bought is present day Muthaiga,Gigiri or Unep,Gachii( which is named after one of his sons)Kihara ,karura Kanyungu and Karura( kagongo)According to old folks,he passed the Gikuyu and Mumbi narrative to his chlidren and grandchildren and so on.my grandmother has been giving me this rich history which was passed to her firsthand by Kihara’s Grandson Njire wa Wangunyu and others of his age( please note that my grandmother found him alive).Now for those who say the Gikuyu and Mumbi narrative or myth( as they call it) is a 100 year myth,how can they explain this?? ?it’s clear this narrative is more than 100 years old.perhaps,from my calculations,it is more than 500 years old. For those saying we came from Ethiopia,Congo etc,i think that is far fetched imagination,and is very difficult to ascertain. To the lady asking about her clan,your mothers name has nothing to do with her clan.as Mukuyu put it.consider yourself as belonging to the aicakamuyu clan since your mother is not married.Thank you for all this informative forum. Tell your friend to read about cege wa kibiru. She will enjoy what is written about the anjiru. Thank you so much this is so helpful to us the young people.at least we can have a sense of belonging by knowing our culture….. The last question now.what is the meaning of my father’s name ” Gitarang’a” i have searched for it in vain . I are u by any chance the 1st daughter, 3rd or 5th? Im very interested in knowing more about my muhiriga i am a Mugaciku wa mbari ya Ciri. I recall our traditional home was in Muranga but moved to Kiambu area theres a place in Thika called Gatei village. One of my Grandfathers sisters narrated that we came from the North from around Ethiopia ( some family members are mistaken for them) and became Kikuyu by adoption. We have family members called Githongo and when they settled in Kiambu it is said he owned the area of Githunguri till Ndarugu. Also could you give me more info about my mother’s side her grandfather was Wangombe wa Ihura. Sadly most of the people who could give information have gone ahead. I think we run the risk of stereotyping Ethiopians. My Dad’s side of the family comes from the ruling dynasty of Zangwe and Axuma/Xuma before them and we do not look like Oromos and they only make up less than 40% of the population. They seem to travel more outside of their country than the Bantus in Ethiopia. Their surnames and clan names give them away: Mbatta’s etc. if you really want to know who you are, you need to learn your clan names and/or clan praise names and you can then start tracing. My good friend,this is not about stereotyping anyone especially Ethiopians for that matter.It is,i believe,trying to trace once roots/history especially our Kikuyu roots,origins,names,blood connections with/from other tribes.I gave myself as an example to show how we African tribes are interrelated with each other & how customs,looks,cultural practices lead to exceptional similarities. I might not clearly know exactly what tribe,in Ethiopia, my great great grandmother came from as my family’s surnames are purely male Kikuyu names.All i know is her original name was ”Ndongi” but those girls who are named after her are called ”Njeri” meaning who visits frequently.This name was given because it was said she ”visited'( read raised & later married) Kikuyuland from Ethiopia. Very informative. Thank you Mukuyu. Nothing beautiful than knowing our origin. Sometimes back there was a man called “embrose wakaria” he used to come to Coro FM a kikuyu radio station. he had a very rich kikuyu history and all the above comments and contribution of Mukuyu he mentioned. I remember as well he mentioned regarding the ark of covenant “ithaga” in Mt. Kenya and how it was moved from Jerusalem to Mt Kenya. this was back in 2007 or 2006 if i can remember well when he taught this. He claimed that he knew where the ark of covenant is but due to “muma” or oath he took can not say where it is even at death point. Mind you even today its still there and kikuyu elders still go to sacrifice at that place where the ark is kept. for instance 2007/2008 post election violence he asked people to go round Mt. Kenya and and a sacrifice was done at mt kenya where the ark is. and the war ended. my story regarding the ark of covenant is based on him” wakaria”. thanks mukuyu for that input. Aicakamuyu are descendants of one ‘WAMUYU’ much as Anjiru are descendants of one ‘Wanjiru’ both daughters of Gikuyu and not a description of children born of single mothers. The central problem with the children of Wamuyu was that unlike Wanjiru she remained unmarried. Up to the point where clans began to be inherited paternally there was no problem. After that, ANY unmarried woman’s children would automatically be Aicakamuyu until born ritually into another clan. Sample this>. My Clan is Munjiru and so is my unmarried sister. What clan does her children belong to? Don’t they belong to our Anjiru clan? or do they automatically belong to the Aicakamuyu clan, in which case it will mean they descend from Wamuyu, which is not the case. Am sorry about your sister but since children now belong to the father’s clan they could be anything including Nyang’ori or Rubwa. To become Anjiru the mother needs to talk nicely to their uncle, (you) and he will follow the necessary rites to make them Anjiru. Right now they automatically default to the Aicakamuyu clan. 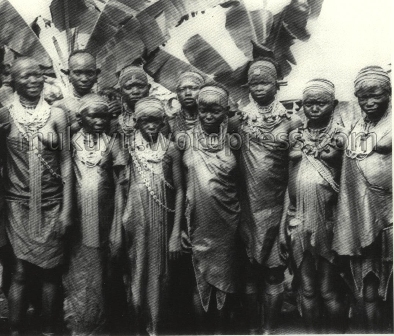 If the photo depicts the nine brides, circa 1902-1930, The Gikuyu did not have clans before then? Moses surely, This is only an illustration. These are NOT the original girls.